Hey! It’s a sliding puzzle! 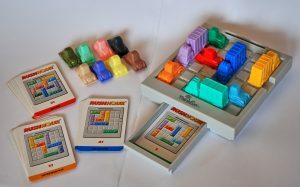 Rush Hour, a sliding block puzzle, manufactured by ThinkFun. If you’ve heard me talk about how I find balance with Time Energy and Resources, you know I do it by shifting the things you overdo to make some room for the things you want to do more (or don’t yet do because you can’t). You have heard the flask metaphor as I’ve mentioned in other posts – pouring time, energy and resources out, filling other flasks. However, you may also think it sounds a lot like something else: those sliding puzzle games. These games are usually made up of sliding squares. You shift one thing to make room for the other and so forth, in a certain order. My son enjoyed those puzzles. I’ve enjoyed them myself and found that I’m ok at them. You may have tried them and agree with the article over at How Stuff Works – you think it can be pretty maddening. It is. Trying to find balance in your own schedule can be like the puzzle. You can and probably do feel like sliding one thing only shifts something else: same problem, different location. Like the puzzle solver you may not know that you are actually one step closer to solving because you lack the trail that got you there – you just see where you are. It can be daunting. You can give up and just leave it alone. Though I don’t fault you for giving up on the puzzle, I don’t want you to do that with your own schedule and energy. The Difference or, Take That, Stupid Puzzle! The difference between seeking balance and my particular way of finding it, and the sliding puzzle is as follows. Space is finite and fixed – when you shift the squares on the puzzle, you never create more room. Shifting a square up leaves a hole behind it, switching one into that hole leaves a hole behind there. One step at a time – The puzzle (well most of those kind of puzzles) forces you to shift one square at a time. One square, then the next, then the next. You can shift more than one thing at a time in your schedule or efforts. We do that regularly. Like the puzzle we sometimes find two things are connected. Unlike the puzzle we can move them both at the same time! The number of tiles never change – one of the challenges of the puzzle is that there’s always just one extra space, and the number of tiles remains the same. Thus the Puzzle Madness. You have to work within the confines. In the course of coaching, some of the tiles may go away. Meaning, we may limit or remove an activity that you didn’t want to do, and that removal may make room for more than one other tile. In fact you may remove a tile and not replace it immediately*. Along the same lines, some of the tiles may change size, grow larger or smaller. It’s a much more complex and wonderful kind of puzzle. A little action may create a big reward. Understand that it is not as complicated or overwhelming as it seems. When it is all laid out for you, it becomes very clear. And, actually fun. * When people do that on their own, for a long period of time it’s sometimes called boredom. See my post titled Congratulations: You’re Bored.